Temple of the Emerald Buddha | Let's Go for a Trip! The Wat Phra Kaeo (Temple of the Emerald Buddha) is regarded as the most sacred Buddhist temple (wat) in Thailand. The royal monastery is situated on the northeastern/ northwestern corner of the Grand Palace in Bangkok. The Emerald Buddha, a dark green statue, is in a standing form, about 66 centimetres (26 in) tall, carved from a single jade stone (Emerald in Thai means deep green colour and not the specific stone). Except for the Thai King, no other person is allowed to touch the statue. The King changes the cloak around the statue three times a year, corresponding to the summer, winter, and rainy seasons, an important ritual performed to usher good fortune to the country during each season. The Royal Thai Decorations and Coins Pavilion is also located within the Grand Palace compound on the right hand side before entering the palace’s inner gate. This place displays a collection of coins and other monetary exchange units used in Thailand, as well as Royal regalia. The pavilion is open daily from 8.30 to 15.30 and admission is free. 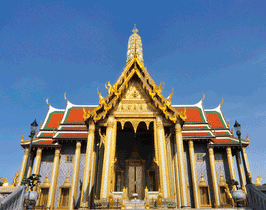 The Grand Palace is open to the public every day from 8.30 to 15.30. The admission fee is THB 250 for foreigners (free for Thais) includes entrance to the Royal Thai Decorations and Coins Pavilion and Vimanmek mansion. The sacred temples in Thailand follow a dress code, which is strictly followed. Men must wear long pants and long-sleeved shirts and shoes; women must wear long skirts. Visitors who arrive dressed otherwise may rent appropriate clothing items at the entry area of the temple. It is compulsory to remove the shoes before entering the temple, as a sign of respect of the Buddha, as is the practice in all other temples in Thailand. While offering prayers before the Buddha image, the sitting posture should avoid any offensive stretching of feet towards the deity; the feet should be tucked in towards the back. How to Get There : SkyTrain to Saphan Taksin Station (S6) (Silom Line). Leave via exit 2 and take a Chao Phraya Express Boat at Sathorn (Central Pier) to Tha Chang Pier (N9). You can take the Orange flag boat at 15 Baht or the Green Flag boat.